In 2008, Ian Stuart attended Open Repositories in Southampton. At that event, he took part in discussions, the developer challenge, and the Poster Session (the Depot had just been launched). Over a coffee with Les Carr, they talked about this and that…. and how there was a need for a conference that wasn’t a formal conference, cheap enough that smaller organisation could afford to send someone, interesting for developers as well as managers, and looked at the stuff that Open Repositories didn’t look at. This lead to the pun Fringe: being in Edinburgh during the Edinburgh Festival Fringe (thus an added attraction for attending) and looking at the fringes of the repository landscape. 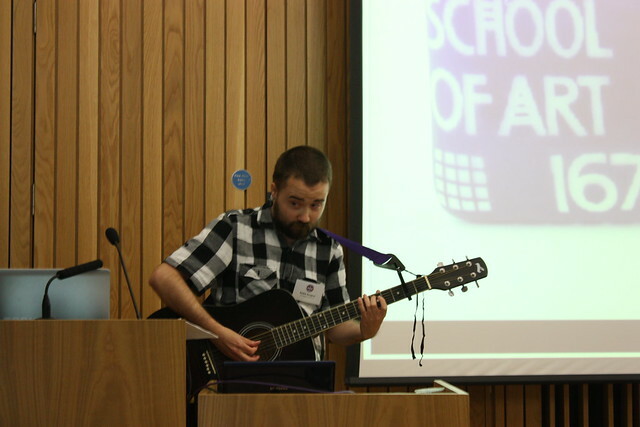 Upon returning to EDINA, he enthused about the idea and, after a shaky start, Theo Andrew (the manager for both the Depot and the Edinburgh Institutional Repository) took on the task of organising the first event. With massive support from JISC, Theo gathered a team of half-a-dozen people to help put on an event that attracted over 100 people. The 2008 event was held in the Playfair Library, part of Edinburgh University’s Old College. We pulled in Dorothea Salo (University of Wisconsin) for the Opening Keynote, and David De Roure (Southampton) for the closing speech. In 2009, the event was more formally established, and we had official blessing from EDINA, the DCC, and the University Library. The event was organised by Philip Hunter (Digital Library) and Robin Rice (EDINA/Data Library), and was held in the Informatics Forum. Ben O’Steen and Sally Rumsey (Oxford University Library Services) did a team-tag Keynote, and Clifford Lynch (Coalition for Networked Information) jetted in to give the closing speech. 2009 was the year we introduced Pecha Kucha talks. 2010 saw James Toon (of ERIS) and Ian Stuart (EDINA) take the helm, and we held the event at the eScience Centre. Tony Hurst (The Open University) gave the Keynote, and Kevin Ashley (DCC) closed the event. The event had to move to the end of the Edinburgh Festival, as Open Repositories was (a) in Spain, and (b) 6th-9th July – the same month as the traditional RF date. Robin Burgess delivers his Pecha Kucha through the medium of song. In 2011, Stuart Macdonald (EDINA/Data Library) and Martin Donnelly (DCC) took the reins, and we returned to the Informatics Forum. We had planned to return to the incredibly helpful eScience Centre, however it had lost its funding, and closed :sadness: The opening Keynote was by Eloy Rodrigues (University of Minho) and the closing speech by Gary Hall (Coventry University). 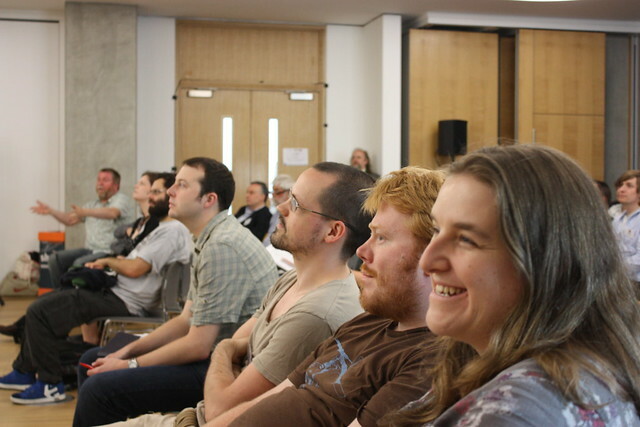 In 2012 the Repository Fringe team took on the organisation of the International Open Repositories Conference in Edinburgh with Kevin Ashley (DCC) as Programme Chair and Stuart Macdonald (EDINA) and William Nixon (University of Glasgow Library) co-chairing the OR2012 Organising Committee. Rather than run as a separate event Repository Fringe ran as a strand of the main conference through Pecha Kucha sessions exploring the conference theme of Open Services for Open Content: Local In for Global Out. For 2013 Repository Fringe returns to it’s regular slot during Edinburgh Festival Fringe preview week with Nicola Osborne (EDINA) taking the helm.